The initial author of a key Justice Department letter wasn’t revealed — until today. In December, the Department of Justice requested that the Census Bureau add a question to the 2020 survey that would ask respondents to reveal whether or not they are U.S. citizens. 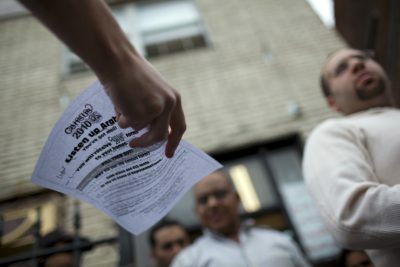 Since ProPublica first reported the DOJ’s letter, civil rights groups and congressional Democrats have announced their opposition, arguing that in the midst of President Donald Trump’s immigration crackdown, the question will lead many people to opt out of the census, resulting in an inaccurate population count. A lot is at stake. The once-a-decade population count determines how House seats are distributed and helps determine where hundreds of billions of federal dollars are spent. But one question regarding the December letter remained unclear. The letter was signed by a career staffer in a division of the DOJ whose main function is handling budget and procurement matters. Who, observers wondered, was actually driving the policy change? Emails obtained by ProPublica in response to a Freedom of Information Act request provide an answer: The letter was drafted by a Trump political appointee who is best known for his work defending Republican redistricting efforts around the country. Gore came to the Trump administration from the law firm Jones Day, where he was an appellate specialist best known for defending a range of Republican state redistricting plans that were attacked as racial gerrymandering by opponents. Gore, for example, helped defend a Virginia redistricting that was ultimately thrown out by a court which ruled that the legislators had focused too much on race. The emails show Gore sending a draft of the census letter to Gary in early November under the subject line, “Close Hold: Draft Letter.” Gary signed and sent the letter the next month and then emailed a note to Gore confirming it was being mailed. It’s not clear why Gore, who did not respond to a request for comment, didn’t sign the letter himself. The Justice Department press office also did not respond to requests for comment. ProPublica previously reported that Gore wrote a filing changing the department’s position in litigation challenging Texas’ voter ID law. The Obama-era DOJ had pursued litigation claiming that the Texas statute intentionally discriminated against minority voters; the Trump administration then withdrew the claim. Gore wrote the filing largely by himself but asked career attorneys who’d long been involved in the case to sign it. A decision on adding a citizenship question to the 2020 census is expected by the end of the month and will be made by Secretary of Commerce Wilbur Ross. The Census Bureau is part of the Commerce Department. Separately, the Trump administration has taken a second step that suggests a philosophical commitment to including citizenship questions as part of the census. It selected as its first political appointee at the Census Bureau a longtime legislative aide to former Sen. David Vitter. The Louisiana Republican made headlines for years by repeatedly introducing controversial proposals for the census to ask about citizenship and immigration status. Christopher Stanley, who left his job on Capitol Hill late last year, will take one of the Census Bureau’s three politically appointed positions, as the chief of congressional affairs. It’s not clear when Stanley will begin but a spokesman for the Commerce Department confirmed the selection to ProPublica. The position does not require confirmation by the Senate. Stanley does not appear to have made public statements about the census. But he was Vitter’s legislative aide when the senator introduced a series of measures to change the census that elicited fierce opposition. Stanley worked as an aide to Vitter, first in the House and then in the Senate, for over 15 years, ultimately rising to be the senator’s legislative director. The Census Bureau is exploring options about adding a citizenship question to the next census, amid a firestorm of protest about the controversial proposal. Before the last census in 2010, Vitter led a legislative effort to get the bureau to add a question about citizenship. It failed. At the time Vitter criticized the system of congressional apportionment for being based on the count of all residents, not just U.S. citizens. “States that have large populations of illegals would be rewarded for that. Other states, including my home state of Louisiana, would be penalized,” he said at the time. The proposal was attacked by civil rights groups. Vitter tried again in 2014. And in 2016, he introduced another amendment that would have required the census to ask about both citizenship and immigration status. Since the U.S. Constitution was adopted, the full, once-a-decade census has always inquired about U.S. residents — or “free persons” as the original language put it — rather than citizens. At times in the past, the census inquired about citizenship, but last did so in 1950. The Census Bureau currently asks about citizenship on a much longer survey that goes to a small percentage of U.S. households. Stanley did not return requests for comment. Vitter’s stated reason for adding a citizenship question — to change congressional apportionment — contrasts with the December letter from the Department of Justice to the Census Bureau. That letter argues that more data on U.S. citizens is needed to better enforce the Voting Rights Act. Do you have information about the Trump administration and the census? Contact Justin at [email protected] or via Signal at 774-826-6240.